Bring in some natural items such a pretty flowers, sea shells, rocks, etc. Let the children pick them up and look at them. Talk about how pretty they are. Ask them if they know anyone who can make anything as beautiful as the things they are looking at. Comment that only God can make these things. Bring in pretty paintings (or pictures of paintings) of sunsets. Talk about how pretty the sunset is and how the person who painted the picture is very talented. Ask the children if they have seen a real sunset. Ask them which they thought was better -- to see the real thing or a picture of the real thing. "God's Amazing Creation!" 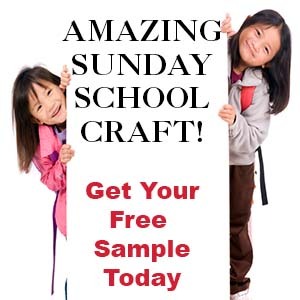 printable journal contains eight pages with a different Bible verse about creation on each page. It is available to members on The Resource Room and as an instant download. Read "The Looking Book" by P.K. Halliman. Explain to your children that sometimes we forget to really look at and appreciate God's creation. If we don't take the time to explore everything around us, we miss out on a lot of amazing things. 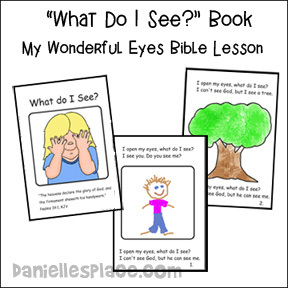 Give your children "looking glasses", magnifying lens or binoculars, and a God's Amazing Creation! printable journal. Take them outside and tell them to look and find something that they find interesting, pretty, or amazing and draw the object in their book. Give your children time to share what they have observed and then encourage them to write a short prayer thanking God for his amazing creation. I open my eyes, what do I see? I can't see God, but he can see me. Children draw pictures of wonderful things they can see that God has made. 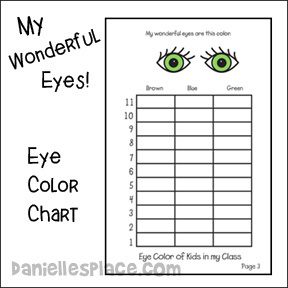 Children color pictures of eyes to match their own eye colors and then work on a chart that shows how many children in their class have each eye color. This is a great activity and takes very little preparation. Have your children draw their favorite things on heavy paper. Tell them to draw something they like to see with their eyes. Ask them to think about why they like to see or draw what they have picked. You can also give them stickers that they can add to their pictures. Stickers are great for very young children who have a hard time drawing. Video tape each child to make a movie. It would be best if you can do this in a separate room where it isn't noisy. Tell your children to say something about what they drew. They might say, "I like to see beautiful, red flowers. Show the movie to the children at the end of class and when the parents come to pick up their children. Your children will probably want their parents to see them in the movie. See how fast they can say it. Bring in some pictures from nature magazines. 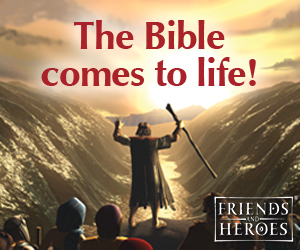 You can use landscapes, animals, oceans, planets, or anything that God created. Show the children each of the pictures and hang them up in the front of the room. Pick out a picture you want to describe and start by saying, "I spy with my little eyes something God made that __________________________ (Describe something you see in the picture.) 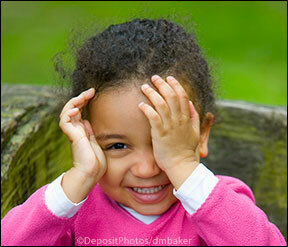 Let one of your children try to guess which picture you are describing. The child that guesses correctly gets to take a turn. Make sure your children say the whole saying each time including, "something God made". 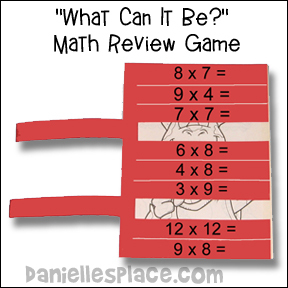 This is a great way to review math facts that your child is having trouble remembering. Ask your child to pick any math fact on the page and tell you the answer. If he can tell you the correct answer, he gets to lift the flap to reveal part of the picture underneath. If he doesn't guess correctly, tell him the answer and have him pick another problem. Keep playing until he has discovered what the hidden picture is. Also included in the lesson: Art, fun with numbers, fun with letters and words, physical fitness, cooking, and just for fun ideas. Faith Based Into His Arms Kids Rug Rug Size: 7'8" x 10'9"